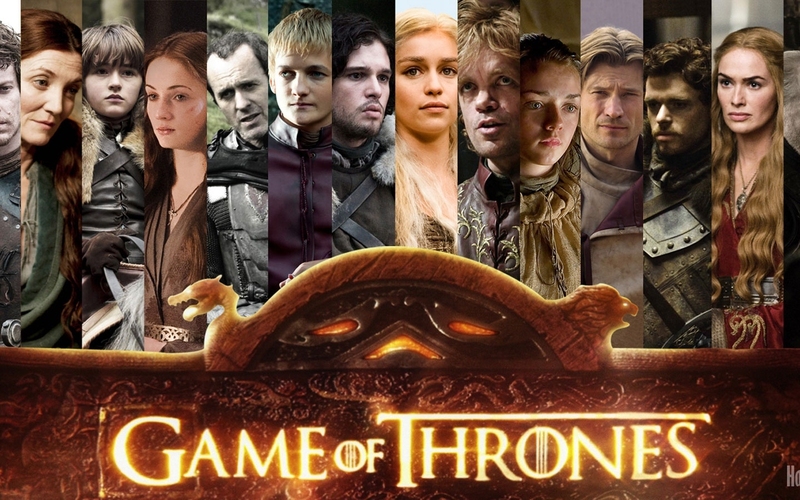 Before it was a prime time television show, Game of Thrones are legendary, which were released as “A Song of Ice and Fire” series and enjoyed by everyone from teenagers to stay-at-home parents and retirees. 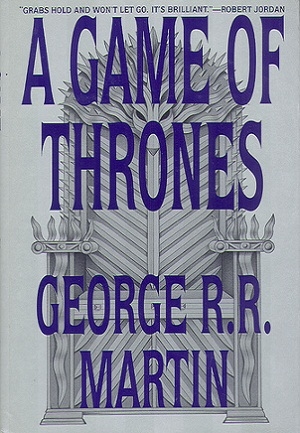 Since the first book was released back in 1996, American author George R. R. Martin has published a total of 5 award winning novels, with another 2 proposed to finish off the series. What is it about this series of high fantasy novels that readers find so utterly compelling, so impossible to put down? And perhaps more importantly, what is the correct order of the Game of Thrones books?! Confused with Game of Thrones book order? Here’s the answer. First published in 1996, winner of the 1997 Locus Award and a New York Times bestseller. First published in the UK in 1998 (1999 is the USA) and winner of the 1999 Locus Award. First published in 2000, winner of the 2001 Locus Award and the 2002 Geffen Award for Best Novel, and so long that it’s paperback edition was published as two separate books in some countries—Part 1: Steel and Snow and Part 2: Blood and Gold. First published in 2005 and nominated for a total of 4 literary awards. First published in 2011, debuted at #1 on the New York Times bestseller list and winner of the 2012 Locus Award. Expected to be released sometime between 2015-2017, with the novel estimated to be over 1500 pages. Unknown release date, but the author has been firm in his conviction that this will be the final book. So this is the correct Game of Thrones book order. Read on to know the theme of each book and I'm sure you definitely will be attracted by this book series. If you haven’t read this book series yet, which could be a little embarrassed to admit though, you can find the introduction & review for each book in Game of Thrones here. How do you summarize an 800 page book? The first novel in the Game of Thrones book series is actually composed of three stories, told from the point of view of eight separate characters. The main portion of the book reads like a medieval court drama, highlighting the politics and conspiracies of the noble Stark family who live in the mythical Seven Kingdoms of Westeros. The second story follows the life of Princess Daenerys, descendent of the last royal family and exiled on another continent. The final story arc follows an illegitimate son of the noble Stark family, Jon Snow, who is a member of an elite military unit known as the Night’s Watch. But for what exactly happens there, you need to find out by yourself. Review: This book polarizes readers – goodreads.com seems almost entirely comprised of either five or one star reviews. Perhaps it can best be described as an emotional roller coaster. You'll hate it, you'll love it, you'll vow to never read it again and then you'll be eagerly looking for the sequel. 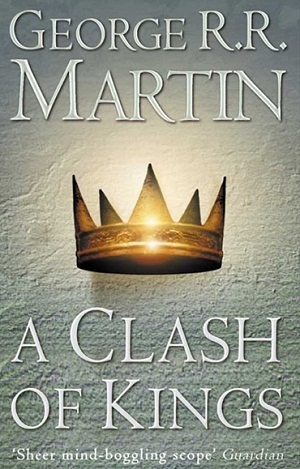 The second book in the Game of Thrones book order, A Clash of Kings delivers on the titles promise. A bleeding star causes differing cultures to believe alternate prophecies are being fulfilled, leading to five separate kings clashing for power. Meanwhile, rumors are drifting across the sea that exiled Princess Daenerys has dragons at her disposal, creatures believed extinct for over 100 years. As a result of this turmoil, the kingdom is ripped apart by riots, and dissent begins to spread amongst the people. All of this conflict climaxes in the epic Battle on the Blackwater, the outcome of which will decide the ongoing fate of the land. Review: Perhaps because those who didn’t enjoy the first book didn’t go on to read the second, A Clash of Kings enjoys a much higher reader rating on goodreads.com (4.38 stars out of 5). All the things that made the first book such a good read are present in the second, but the characters evolve, the plot thickens and you'll find yourself sucked once again into this epic fantasy world. In a word: regicide. 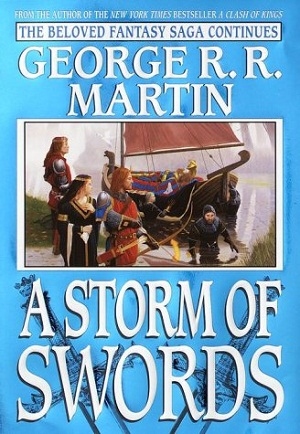 This theme recurs throughout A Storm of Swords, which takes place in the aftermath of the Battle of Blackwater from book two. A series of marriages, designed to cement peace and forge alliances within the Seven Kingdoms, instead are met with treachery, deceit and murder. Meanwhile, across the Narrow Sea, Princess Daenerys purchases an army for herself and sets off on a determined conquest of Slavers Bay, sacking cities and taking on the title “Breaker of Shackles”. To the North, Jon Snow and the members of the Night Watch face treason within the ranks and an enemy they are ill prepared to battle, culminating in the selection of a new Lord Commander. Reader Reviews: Given 4.5 stars out of 5 (based on over 344,000 ratings on goodreads.com), A Storm of Swords continues the success of this series, although the horror and brutality is stepped up a notch. This book is gripping, but in a horrifying sort of way. Shocking things happen, you're left traumatized and in tears, but at the same time, you can't bear to stop reading. Focusing more on the lesser characters of the Seven Kingdoms, A Feast for Crows continues with the themes of royal intrigue, plotting and betrayal. Legendary stories of the conquests of Princess Daenerys grow more epic in their re-telling, as she continues to defeat her enemies in Essos. Meanwhile, the bloodshed of the previous novel has left a power vacuum within the kingdoms, leaving royal households and their many rivals scrambling for power and greater military advantage. This lust for power results in a kidnapping, the unwise revival of a disbanded military order and a kingsmoot calculated to provide the Iron Islands with a new king. 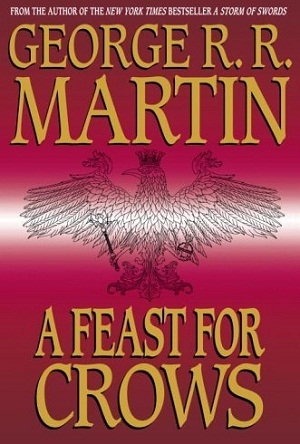 Reader Reviews: Not rating quite as high with fans as previous books in the series, but still a respectable 4 out of 5 stars on goodreads.com, A Feast for Crows was essentially written as one half of a two book volume. Unfortunately, you can tell. The story is filled with the missing main characters, unfulfilled plot lines and just an enduring sense that is necessary to the development of the series. This book isn’t going to amaze you like its predecessors. In a departure from the previous novels, the fifth book in the Game of Thrones book order takes place concurrently with its predecessor and focuses on some of the characters whose stories were omitted from the previous book. Jon Snow is shown struggling with hard choices as the new Lord Commander of the Night Watch, facing a looming and deadly threat to the North. Meanwhile, Jon’s younger brother (previously assumed dead) journeys north of the Wall in search of a creature he sees in his dreams. In the South, Daenerys has declared herself Queen, but after finding her new subjects opposed to her liberal policies, she agrees to marry in an effort to stop the bloodshed. 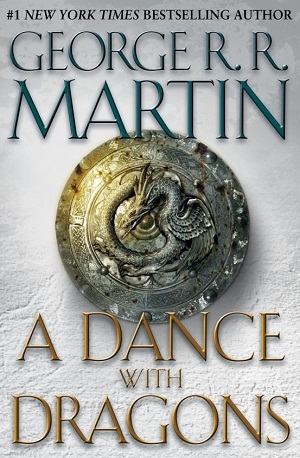 Reader Reviews: The recurring theme amongst the reviews on goodreads.com, where A Dance With Dragons rates a 4.2 out of 5, is that this book includes a lot of necessary but not overly interesting plot lines. Unfortunately, it just doesn't reach the dizzying highs of the first three books. The end result is you're left constantly expecting something shocking or thrilling to happen...only it doesn't. It's not until the conclusion that you find yourself suddenly, eagerly anticipating the release of book number six.